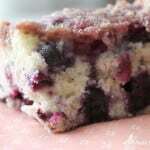 This Blueberry Buckle recipe is a delicious cake bursting with blueberries. It’s perfect for parties and family gatherings! It’s no secret that blueberries are one of my favorite fruits to bake with! Nothing beats biting into a warm muffin or cake filled with these yummy berries! Every summer my husband, kids, and I head over to my grandmas house where she has at least 100 blueberry trees. We pick enough blueberries to freeze to last throughout the whole winter. You can use fresh blueberries or frozen for this recipe and it will taste the same! This fits recipe fits perfectly in a 9 x 13 inch pan for larger gatherings or even a 8 x 11 inch pan. The cake will be a little thicker the smaller the pan and you will need to keep an eye on it while it’s baking. It may need a longer cooker time in the smaller the pan. 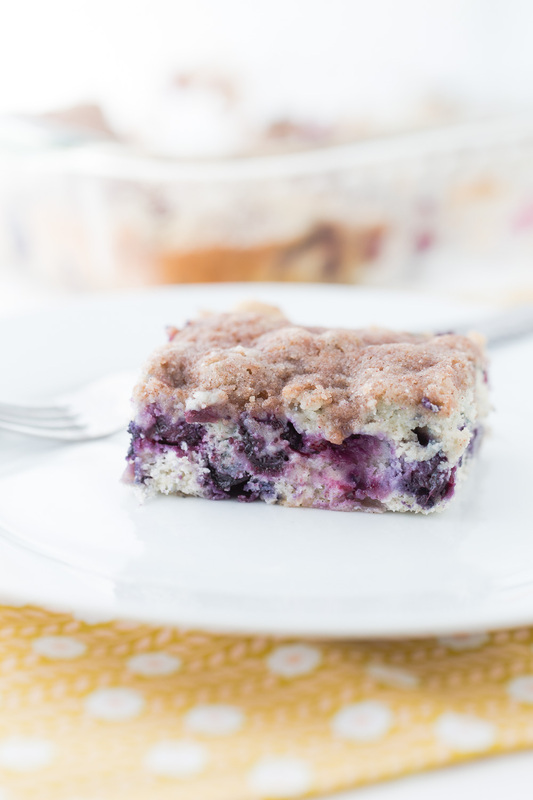 The cinnamon and sugar topping is the perfect crunch on this blueberry buckle and definitely everyone’s favorite part! 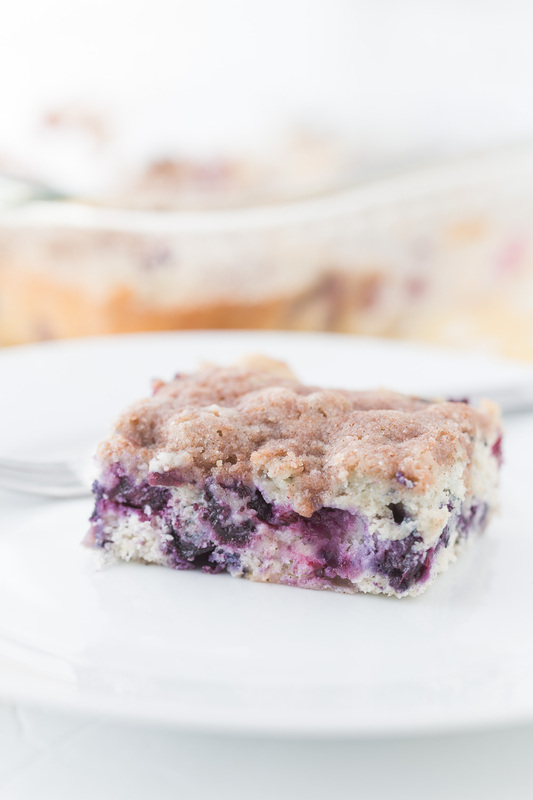 Delicious cake filled with blueberries and topped with cinnamon sugar. Combine the sugar, shortening, egg, milk, flour, baking powder and salt. Pour the mixture in a greased 9 x 13 inch pan. Sprinkle the topping mixture on top of the cake. Bake at 350 degrees for 30-35 minutes or util a toothpick inserted comes out clean. *If you use frozen berries your cake mixture will get quite cold and form into a large "ball" when transferring to a pan. Just use a spatula or your hand to push the cake mixture to fill the pan. *We also found that the cake mixture fits into an 8 in. x 11 in. pan just fine as well. Makes the cake pieces thicker. Just adjust baking time if needed. Great recipe! I made this tonight for a family gathering & it was a huge success! There were only 8 people and the entire pan is gone plus they asked me to bake another pan when they saw I had extra blueberries so there’s another pan of this delicious cake in my oven right now! I bake for my family all the time and have never seen them devour something that fast and ask for more! I will definitely be making this many more times. Thanks so much! I made with this blackberries instead or blueberries and came out really good. Thanks for the recipe. This looks great, but mornings are really hard for me. Could you make this like the night before and put in the oven in the morning? this recipes looks lovely – I have tons of blueberries in the garden at the mo! I have some lemons I want to use with this (lemon blueberry flavor combo) so should I just add less milk (e.g. 1/4 cup milk but also 1/4 lemon juice)? Also I don’t have shortening, is some amount of butter an acceptable substitute? Thank you for the nice recipe, Katie.